← What makes a good model organism? How are models different from one another? Is there any truth to the rumor that ants eat cows, people and crops? @BugQuestions I once read a short story called "Leningen Versus the Ants." Any truth to ants eating cows, devouring crops, etc? Thanks! If you’ve never read the short story Leiningen Versus the Ants by Carl Stephenson, it’s a read I highly recommend. It’s an interesting story about a plantation owner who has to defend his employees, his farm, and himself from a swarm of marauding ants. It’s considered a classic piece of American literature, and it’s been referenced in every peice of popular culture from MacGyver to Indiana Jones. So what’s the deal with this story? Is it plausible? Do ants really eat cows, people, and crops? What army ants are in the story? Eciton army ant photographed near Quito, Ecuador in 2012. Army ants is a very general designation for ants which swarm rather than build nests, and there are a couple of different types of ants which do this. This story takes place in Brazil, which places our heroes in the path of foraging Eciton army ants. Eciton is the best known army ant…and it’s the ant most people think of when they think about army ants. There’s another type of ant people sometimes think about when talking about army ants, the African genus Dorylus, which are sometimes called Driver Ants. 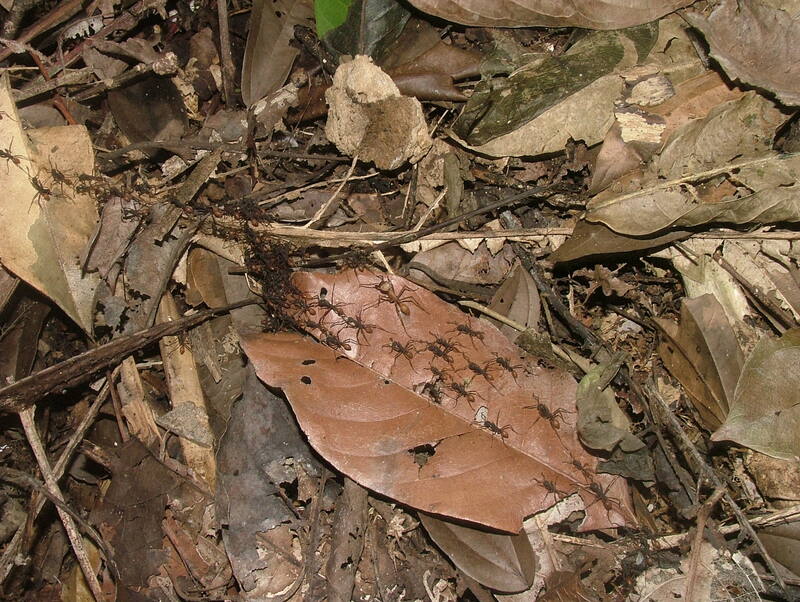 These two types of army ants, Eciton and Dorylus, both have similar habits…but they’re not very closely related. How accurate are Stephenson’s descriptions? In the story, Stephenson spends quite a bit of time describing the movements of the ants. It would be very impractical to go through the story line by line, but we can focus on some of the descriptions which have made their way into popular culture. During this outflanking movement by the wings, the army on the center and southern front remained still. The besieged were therefore able to contemplate at their leisure the thumb-long, reddish black, long-legged insects; some of the Indians believed they could see, too, intent on them, the brilliant, cold eyes, and the razor-edged mandibles, of this host of infinity. The picture at the beginning of this section shows a soldier army ant, which is far smaller than described in Stephenson’s story. The workers, which kill most of the prey, are far smaller than the soldiers we see in the video above. Thumb-sized is a little bit of an exaggeration. An immense flood of ants, about a hundred yards in width, was pouring in a glimmering-black cataract down the far slope of the ditch. Many thousands were already drowning in the sluggish creeping flow, but they were followed by troop after troop, who clambered over their sinking comrades, and then themselves served as dying bridges to the reserves hurrying on in their rear. These descriptions of army ants building living bridges are somewhat accurate. Army ants have a stationary phase where they create a living nest composed of their bodies, a structure called a bivouac, which protects the queen and larvae. When they move to another place, the bivouac dissolves and the workers transport the queen and larvae to greener pastures. While they’re moving, workers do indeed build bridges using their own bodies. Then, as he rode past the stretch where the ants had failed to cross the day before, he witnessed a brief but impressive scene. Down the slope of the distant hill there came towards him a singular being, writhing rather man running, an animal-like blackened statue with shapeless head and four quivering feet that knuckled under almost ceaselessly. When the creature reached the far bank of the ditch and collapsed opposite Leiningen, he recognized it as a pampas stag, covered over and over with ants. It had strayed near the zone of the army. As usual, they had attacked its eyes first. Blinded, it had reeled in the madness of hideous torment straight into the ranks of its persecutors, and now the beast swayed to and fro in its death agony. With a shot from his rifle Leiningen put it out of its misery. Then he pulled out his watch. He hadn’t a second to lose, but for life itself he could not have denied his curiosity the satisfaction of knowing how long the ants would take–for personal reasons, so to speak. After six minutes the white polished bones alone remained. That’s how he himself would look before you can–Leiningen spat once, and put spurs to his horse. Some descriptions of ant biology are exaggerated in the story for dramatic effect. The main character of the story described ants stripping a deer to bare bones in less than 10 minutes. Ants are certainly capable of stripping a large animal-at least a hypothetical dead or immobile animal-but an animal this size would likely take days to strip and consume. Fire ants, for example, can strip a frog to bones in about 12 hours. Other descriptions, such as the wavelike movement of the ants, are more based on a need for dramatic imagery. The ants spread out and hunt in raids which could be said to resemble rivers, but nothing which would resemble a tsunami. The story talks about the army ants eating everything in their paths, but in reality Eciton focuses mostly on insect prey. However some of their African counterparts in the genus Dorylus do attack some crops occasionally, particularly potatoes. However, the genus which is likely described in the story tends to eat bugs more than plants. This is what a more typical encounter with army ants looks like. 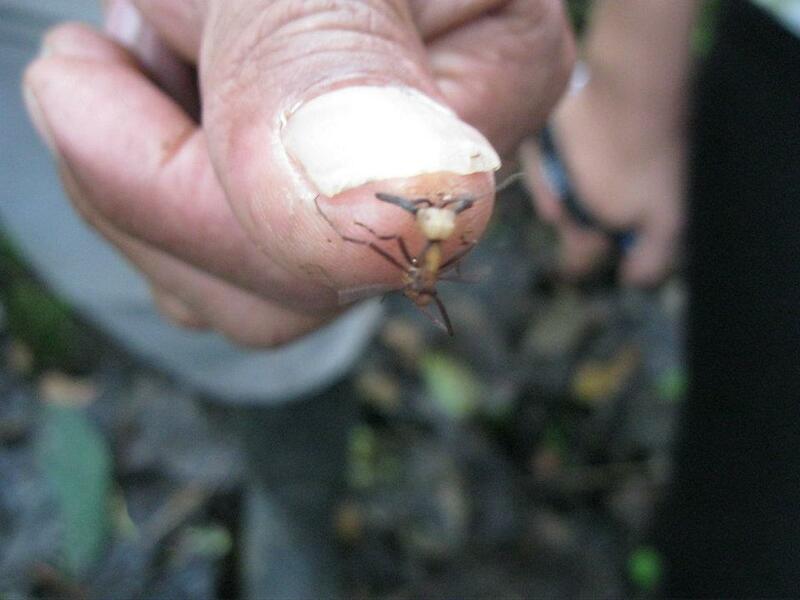 Eciton army ants in Panama. Picture courtesy of Smartse, via Wikimedia commons. The video above was taken in Ecuador, where Nancy and I had our own encounter with army ants. If you know what you’re looking for, you’ll definitely notice them. However, the typical encounter with the South American variety is a lot more tame than Stephenson’s descriptions. Unless you’re the size of an insect, you’re pretty much safe. That’s not to say, however, that real life encounters with ants can’t be dangerous in certain specific situations. Anybody can be allergic to insect stings, and ant stings are no exception. People who are immobile, such as infants and nursing home patients, can also be harmed by ants due to an inability to fight back. However, healthy adults such as the ones in Stephenson’s story, could easily fight back against the ants and are unlikely to be attacked as badly as described in the story above. If you’re capable of walking at a normal speed, you can outrun the ants. In real life ants do have some consequences for agriculture, but the relationship is a lot more complex than simply eating crops. There are a lot of ants which are quite useful for biological control because they eat crop pests. Some cultures even divert army ants into their fields, and let them take care of pest control. Unfortunately, this is a double edged sword because ants also have very well known associations with some types of crop pests such as scales and aphids. The ants eat the honeydew the aphids and scales produce, and protect them from predators and parasitoids. Unfortunately, they can protect them from the predators and parasitoids we use to control these pests. So they might not eat crops, but they definitely make it harder for us to control some pests. In the video below, you can watch ants drive off a ladybird beetle which was trying to eat their aphids. 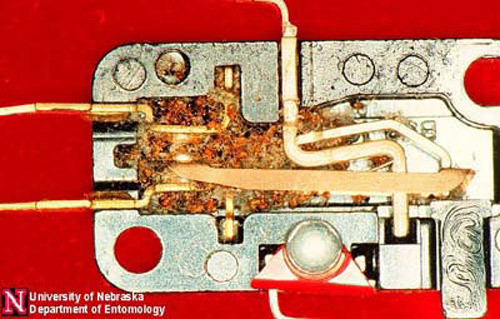 Pharaoh ants in a light switch. Picture courtesy of University of Nebraska Entomology Department. Ants can also be household pests, as well. Pharaoh ants, for example, are really well known pantry raiders in some areas. They don’t sting, but people can become allergic to their leftover corpses. They’re also notorious for breaking into hospitals, where they can spread diseases while looking for food. So Pharaoh ants can still cause medical problems, but not in the way that other ants can. They’re problematic in many unique ways. Personally, I’m a big fan of this story. I’ve always really liked the ingenuity displayed by the main character, and I think Stephenson did a really good job of telling the story. It’s a bit terrifying to be ripped to shreds by something smaller than you, and the reason this has persisted in our culture is that Stephenson did a good job of writing this story. However, even though it’s a good peice of fiction, we must recognize that these are fictional ants inspired by a real life counterpart. As such, they’re going to be very different from the real ants. As a healthy human, getting killed by army ants is a little farfetched. It’s not entirely outside the realm of possibility, but you’re probably more likely to be killed by a honeybee. That’s not to say that ants can’t be somewhat dangerous, or problematic to some of our endeavors. People do die of allergic reactions to ant stings, and ants can harass babies or nursing home patients. If you don’t control pantry ants, you could get uncomfortable allergies as well. Ants can also cause some major headaches for farmers, as well. However, this is one particular nightmare that you needn’t worry about on your Brazillian vacation. This entry was posted in Culture, Ecology, Physiology and tagged Agriculture, animals, ant, cow, cow killer, farm, locust, sting. Bookmark the permalink. 6 Responses to Is there any truth to the rumor that ants eat cows, people and crops? Great post and links to my new feelings about ants. We found a dead snake and I put it on a rock to identify more but the following morning it had been eaten to the bone and we could see the big ants carrying it off, slowly but surely. I did think of what would happen to my body if just left here in southern Spain. Weeks, months…. I’ve filmed army ants in Central America. You gaffer tape around your ankles (boots to your pants or trousers) to make a seal and spray a little insecticide at that point if you are really concerned – you can stand right in them and they won’t come up above your waist if you keep still – they are not remotely dangerous and have trouble disarticulating non-insect food to carry it off. I’ve seen them struggle with quite small lizards, although they have no trouble disarticulating large arthropods – scorpions etc, which have exoskeleton that can be more easily disassembled. I’ve worked putting endoscopes into huge bivouacs containing thousands of ants without any problems. Their soldiers will lock onto you and I have had one attach itself to my eyelid – it is said you can use them as sutures for a wound and this is quite believable – once the mandibles of the head are locked on, you can discard the thorax and abdomen. The mode of operation and just about everything these ants do is really interesting. Ref: Old BBC Wildlife on One. ‘The Body Snatchers’. Producer Keenan Smart. This is interesting in the fact that when I lived in Costa Rica, in a little cabin at the edge of the rain forest, we would have them come through our community about twice a year. The general attitude was to just let them be and try and not to step on them as it seemed to upset the whole group. They only ate insects, dead or alive, but never bothered our cats, dogs, or farm animals or any of our neighbors as far as that goes. Since termites were our biggest actual insect problem they were always very welcome to spend the two or three days in the house. They were also nice because when they were around there was usually at least one anteater in the area and they were usually extremely difficult to locate. A little late to leave a comment on this but I figured it would be constructive. When I was a child and still living in Africa I stumbled into a swarm of these in the middle of a small jungle. I think it was Siafu ants specifically. Being a child I panicked and since I was lost in a spot of jungle at the time I just flailed to get them off me. If Someone hadn’t found me I’m quite sure I would have died as I had ants trying to crawl onto my eyes, inside my mouth, basically every oriface. I was bleeding in several places and was mildly choking on ants, aside from that I had ants attatched to my body and removing them took several days as my family did not seek medical attention at the time. Moral of the story. If you can keep your wits together and can move these ants are safe and easily avoidable but a child who can’t make a proper decision or person not able to move can be killed and caution is still necessary.